Xia Gui (1195-1224). Untitled album leaf. 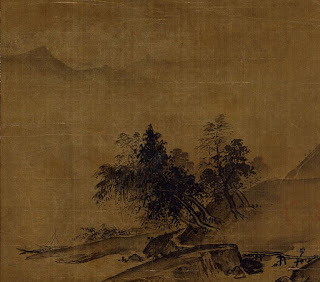 Both Chinese landscape painting and Japanese gardens avoid symmetrical organisation in a composition, it is one of the major differences between the approach to representation between Western and East Asian art. Symmetry in Asian art is seen as evoking a balance of elements in which there is no possibility of flow or movement of ch’i, 気 (ki in Japanese). 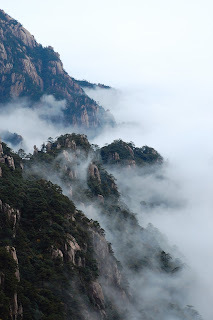 Ch’i in this sense refers to vital energy as an essence of all life, a primordial force that powers the universe, it is generated by the interaction of the opposing, yet mutually dependent, qualities of yin 陰 and yang 陽 (Jp. in/yo). In Eastern thought because the one contains the seed of the other, yin is constantly moving towards yang; the one gives birth to the other in a constant state of transformation. The duality is only apparent, as the two qualities are in fact indivisible from each other. Hence the notion of a stable balance of two forces leads in the Eastern view to a state of stagnation, or a moribund state that is essentially ‘lifeless’. 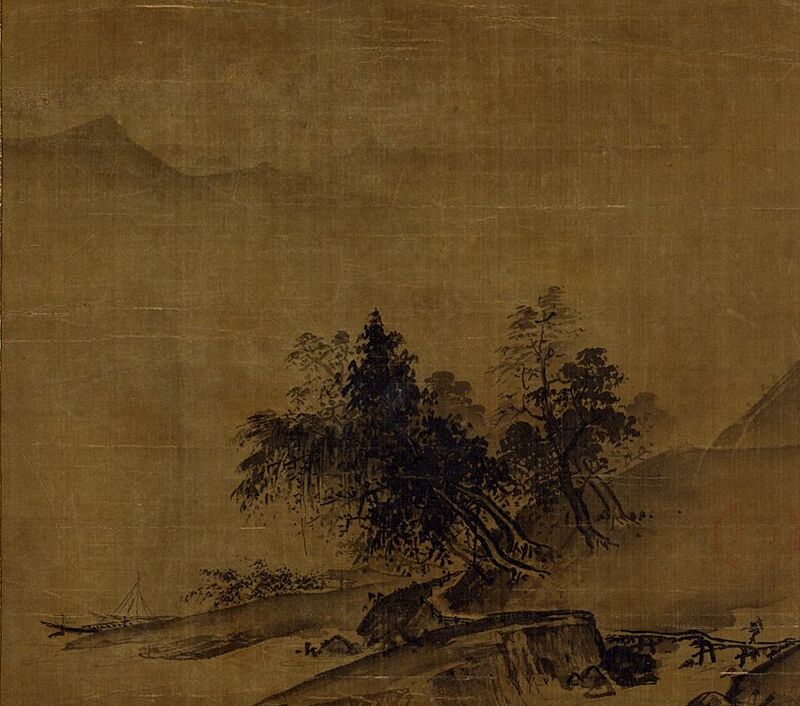 It takes just a cursory glance at a Chinese landscape painting to grasp that the organisation of a composition is asymmetrical, and likewise a glimpse of a Japanese garden shows that here too there is no concern to construct a composition using symmetry. 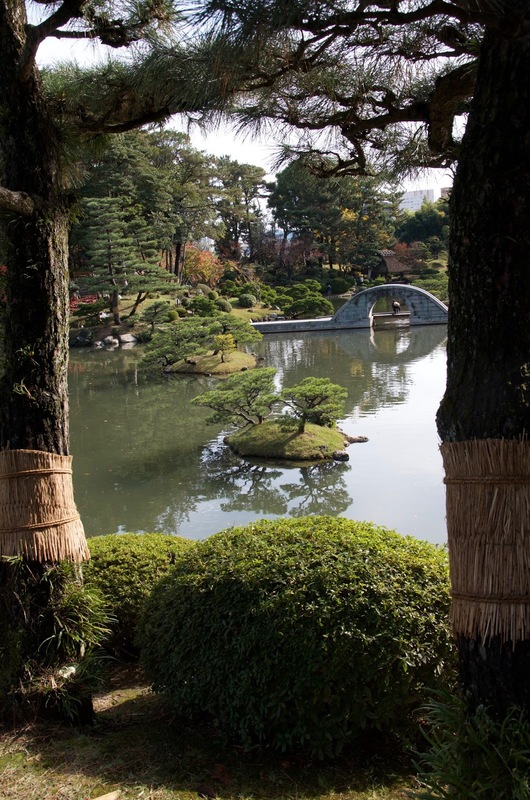 The Japanese garden is an attempt to present Nature as an essence, and if one looks at natural scenery it is also immediately obvious that symmetry is not directly expressed in Nature. Asymmetry is not the same as a random assemblage of elements, in both Chinese painting and the Japanese garden there is order, carefully contrived yet to a certain extent hidden from view. 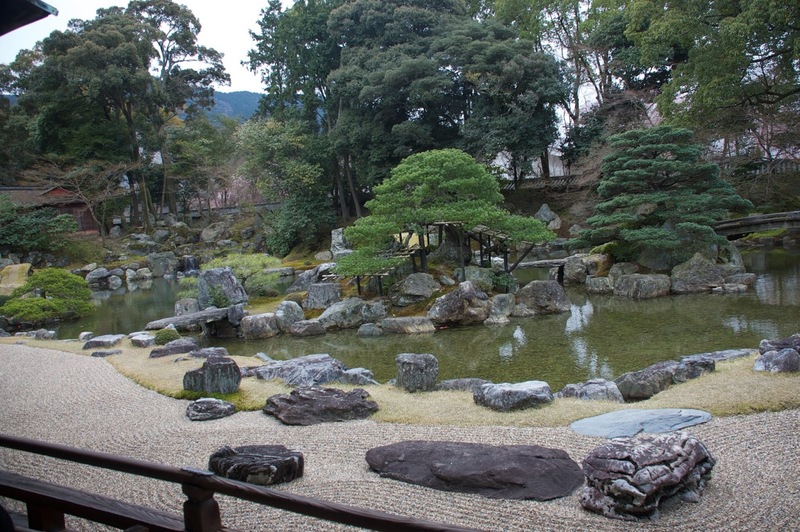 It is quite common in the practice of creating a garden in Japan for the garden creator to strive to ‘hid the hand of man’. That is to cloak the composition in a veneer of ‘naturalness’, whist yet remaining very much a work of man’s hand. The garden just as much as is a painting, is a work conceived and executed by an artist. His or her experience of Nature is filtered through their creative sensibility so finding individual expression through the medium of a traditional cultural form. Asymmetry allows a greater degree of involvement by the viewer as the sight lines and perspectival framework is not rigidly imposed. The eye of the viewer has a freedom to move as it wishes, finding areas of interest as it travels around the scenery being presented. In a Chinese painting it is an immersive journey that the viewer makes in allowing his eyes to travel about the picture plane. This is also true in the garden context, where the viewer will deconstruct the garden before him, and then reconstruct the garden as an interiorised experience. Symmetry and the Western sense of perspective tend to exclude the viewer, setting the viewer outside of the composition as someone who looks in from the ‘outside’. The contrary is true in a landscape painting or Japanese garden where the viewer is central to the whole process of perception and recognition. In both paintings and gardens the intention is to take the viewer beyond the apparent reality of the scene being presented in front of him. To search for and find an essence that draws the viewer and viewed into a harmonious entity, where there is no longer a duality of perception. In this sense the painting or garden creates the viewer, as much as the viewer creates the painting or garden. In further blog posts in this series I will be looking at triadic composition and the techniques of perspective used by the painters, and find correspondences in the Japanese garden tradition.